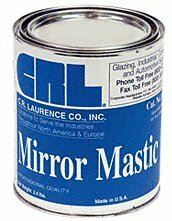 CRL Heavy-Bodied Mirror Mastic is an adhesive mastic formulated for adhering plate glass mirror and acrylic mirror to various substrates, such as drywall, wood, glass, metal or tile. Ideal for large mirrored walls, columns, and vanities. May be used with CRL Category Two Safety Tape Film that has been washed with a 70% solution of isopropyl alcohol (IPA). All applications must have permanent bottom support and mechanical fasteners. Qualifies for LEED® (Leadership in Energy and Environmental Design) Green Building Rating System credit.